The Shiba Inu (pronounced She-ba E-nu) is Japan’s smallest native spitz dog. Their history dates back to the Samurai period, where they were bred to flush birds and small game and occasionally to hunt wild boar. They were later used in dog fighting by the Samurai. There are several theories on how they got their name. One explanation is that the word Shiba means "brushwood", i.e., the bushes they hunted in. Another theory is that the color of the Shiba is much like the autumn red of the brushwood leaves. A third theory is that the word shiba might refer to its small size. Shibas almost became extinct in World War II because of the bombing and then later distemper. A few breeding clubs were formed and saved the breed. An American military family imported the first Shiba Inu into the United States in 1954; however, they didn’t become popular until the 1990’s. Shiba Inus are loyal and affectionate with their family, and do well with children as long as they are properly socialized and trained and the children respect and treat them kindly. They are known for their bold and fiery personality. Shibas can be very independent and not the easiest dog to train. It’s not because they’re not intelligent; they’re just is a bit stubborn. They love to run, and they love to run away. They are escape artists, so be careful when you open the door or you’ll be chasing them a long time. Despite this breed’s idiosyncrasies, owners love them and describe them as funny, playful and loyal. Shiba Inus usually weigh between 17 to 23 pounds and stand between 13 to 17 inches tall. They are small, athletic, and look like a fox with their prick ears, squinty eyes, and tail that curls over their back. Shibas have a thick double coat that gives them the look of a teddy bear. 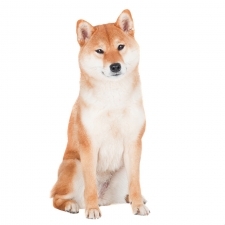 The most popular colors of the Shiba are orange red, cream, and sesame. They are shedders and blow their coat twice a year. Shiba Inus are the 14th most popular dog registered with Americas Pet Registry Inc. Looking and feeling like a teddy bear, Shibas are perhaps one of the cutest puppies you will ever encounter.